After you’ve defined the validation logic for your entities and performed validation automatically or manually, you want to show the aggregated validation messages on the UI. Unfortunately WinRT/XAML doesn’t come with such a functionality out of the box and solutions like Prism for Windows Runtime don’t add much value here as well. WinRT XAML Validation library to the rescue: it comes with two handy UI controls ValidationPanel and ValidationSummary that give you a generic and easy-to-use approach to show validation messages to the user. Show a red/yellow border around the control to represent Errors/Warnings. Show all validation messages for a property at the bottom of the control (optionally). ValidationSource: Bind any ReadOnlyCollection<ValidationMessage> to this property and the control will display the corresponding validation messages (Errors/Warnings). Normally binds to ValidationBindableBase.ValidationMessages[<PropertyName>]. ShowValidationMessages (default: true): Indicates whether the validation message texts will be shown on the control. Otherwise, only a red/orange border will be drawn on error/warning validation messages. ShowPropertyValidationMessages (default: true): Indicates whether simple validation messages for a property (identified by ValidationMessage.ValidationMessageKind.Property) will be shown as text at the control. ShowGroupValidationMessages (default: true): Indicates whether property-group validation messages (identified by ValidationMessage.ValidationMessageKind.Overall) will be shown as text at the control. This can come in handy if you don’t want to use the ValidationPanel for validation messages that span several properties, but show them in the aggregating ValidationSummary instead. 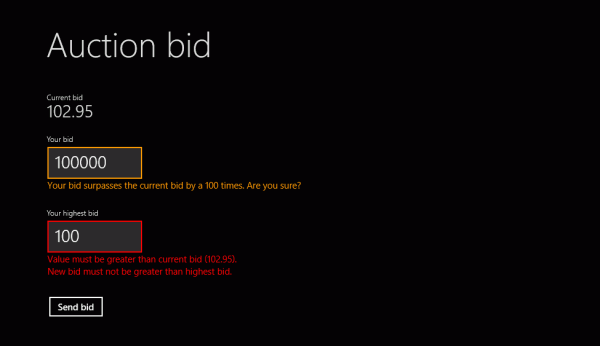 The second control of the WinRT XAML Validation library is the ValidationSummary. While the ValidationPanel can be used to show validation messages for a single property, the ValidationSummary is there to show all aggregated validation messages of an entity. The following picture shows a sample output of the ValidationSummary for a validated entity, including errors and warnings. ValidationSource: Dictionary of validation messages that should be shown in the summary. Normally binds to ValidationBindableBase.ValidationMessages.AllMessages. ShowPropertyValidationMessages (default: true): Indicates whether validation messages for single properties should be shown in the summary or not. ShowGroupValidationMessages (default: true): Indicates whether validation messages for property groups should be shown in the summary or not. This can come in handy, if you want to show this information only in ValidationPanel, but not in the ValidationSummary. AffectedPropertyNames: Collection of property names, whose validation messages should be shown in the summary. If no value is given, the validation messages for all properties will be shown. Header: Header text to be shown above the summary. If no value is given, no header will be shown. ShowHeader (default: true): Indicates whether a header will be shown above the summary or not. Defining validation logic using Data Annotations is the default and recommended way in the WinRT XAML Validation library. But of course there are good reasons that you don’t want to use this approach. For example, you want to have all the validation logic for an entity at a central place or you don’t want your entities to implement ValidationBindableBase or you even don’t have access to the data model entities. In this case you have the possibility to bypass the validation attributes and the ValidationBindableBase base class for your model entities. You get the flexibility to perform validation for yourself and add validation messages to the storage dictionaries. The view model contains the „real“ data model entity as well as the validation storage for the entity. Now both properties are exposed and can be bound to the UI. An upcoming blog post will show you how this happens. Before you start a new validation, make sure to clear the old validation messages by using the ValidationBindableBase.ValidationMessages.ClearMessages() method as shown in the example above. And a final hint: When you use manual validation and leave the validation attributes behind, you loose the ability of automatic implicit and explicit user input validation. You should be aware of this, when you decide which validation option is the best for you. Of course you can mix automatic and manual validation, performing manual validation only in critical situations like saving an entity. Now that you have defined all your validation attributes on your model classes, you want to perform validation to detect if your entity is valid or not. Here you can go two ways with the WinRT XAML Validation library: implicit validation validates your entity automatically when properties change, while with explicit validation you call a function to perform the validation. The method returns true if the entity is valid and false otherwise. 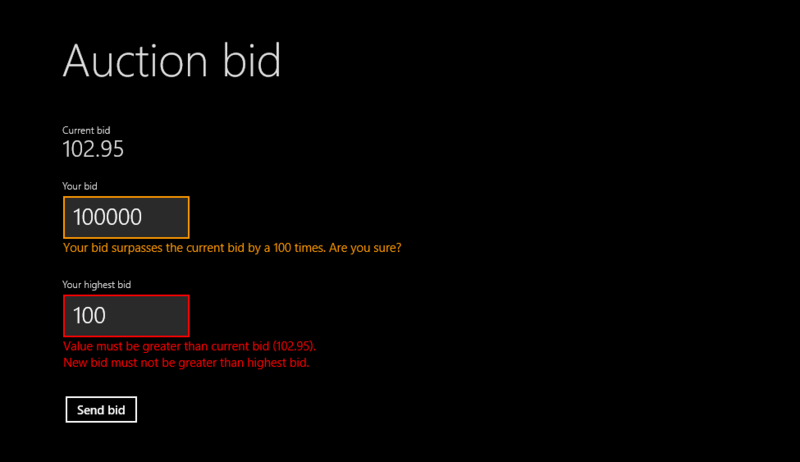 It’s async because of the async validation ability of attributes from the WinRT XAML Validation library. Last posts have shown how basic validation attributes and property-group based validation attributes can be used to define custom validation logic, that goes beyond the default capabilities of Data Annotations. There’s another validation attribute base class in the WinRT XAML Validation library and that’s the AsyncValidationAttribute and its sister, the AsyncGroupValidationAttribute. This sample async validation attribute calls the async service method AuctionService.GetCurrentBidAsync() to retrieve actual data from a server. It gets await’ed and returns the validation result after the async operations has returned. Thus you’re able to define custom validation logic in our asynchronous app world. AsyncGroupValidationAttribute is a specialization of AsyncValidationAttribute, its usage doesn’t differ, so I will not show it here. The usage of an async validation attribute equals the usage of any other attribute on your entity and you’re able to use the functionality of the ExtendedValidationAttribute. All predefined validation attributes in the System.ComponentModel.DataAnnotations namespace can be used to annotate a single property of an entity. So they cannot be used for validation that spans multiple properties. 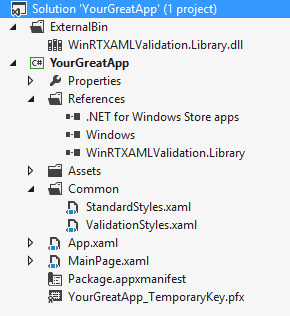 For this case, the WinRT XAML Validation library comes with the GroupValidationAttribute base class. Its member CausativeProperties can be used to define properties, which cause the validation to run, when their values are changing. With the member AffectedProperties you can set properties, that will be marked invalid when the validation of a property from the CausativeProperties group fails. Additionally, the GroupValidationAttribute class derives from the ExtendedValidationAttribute class, so you’re able to use additional functionality brought by the ValidationLevel, ShowMessageOnProperty and ShowMessageInSummary properties and others. Validation in the WinRT XAML Validation library is mainly based on .NET Data Annotations from the System.ComponentModel.DataAnnotations namespace. Here you can find several attributes, that you can attach to your entities and its properties. This annotates them with additional information/metadata, which’s evaluated elsewhere in your code or by the .NET framework. WPF, Silverlight and e.g. ASP.NET MVC can evaluate those attributes automatically to display further information for an entity like a property label, etc.. And you can define validation logic with Data Annotations on your entity, which gets evaluated and presented to the user when the entity is validated. Like the ValidationAttribute you can use the ExtendedValidationAttribute as base class for your custom validation attributes. This little blog posts describes how you can include the WinRT XAML Validation library in your project and get it to work. 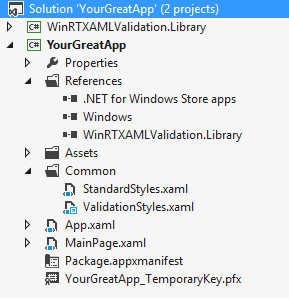 To use the WinRT XAML Validation library, you have two possibilities. The first one is to include the library sources. To do this, copy the WinRTXAMLValidation.Library project to your app’s solution folder and add the existing WinRTXAMLValidation.Library.csproj project to your solution. Copy the ValidationStyles.xaml file to your Windows Store App project and reference it as ResourceDictionary in your App.xaml. Add the ValidationStyles.xaml file as link in your Windows Store App project and reference it as ResourceDictionary in your App.xaml. You’re free to choose from these approaches. Go the „copy way“ if you want to adapt the validation styles to your needs. Go the „add as link“ way if you simply want to use the UI controls as they are. If you don’t want to include the library’s sources to your solution, you can just add the compiled assembly as reference. 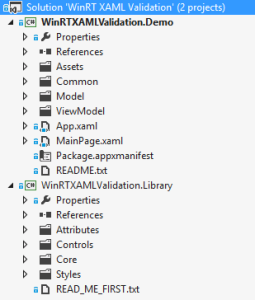 To do this, first compile the WinRT XAML Validation library as Debug or Release. Copy the output assembly to your solution and reference it in every project where you want to use the validation functionality. Copy the ValidationStyles.xaml file from the Styles folder of the library to your Windows Store App project and reference it as ResourceDictionary in your App.xaml. In this article I’m going to introduce „WinRT XAML Validation“, a library that brings consistent validation of user input to WinRT/C#/XAML apps. Upcoming blog posts will cover several aspects of the library in depth. I like WinRT. I like its approach of bringing common functionality to very different languages. But WinRT is not perfect. 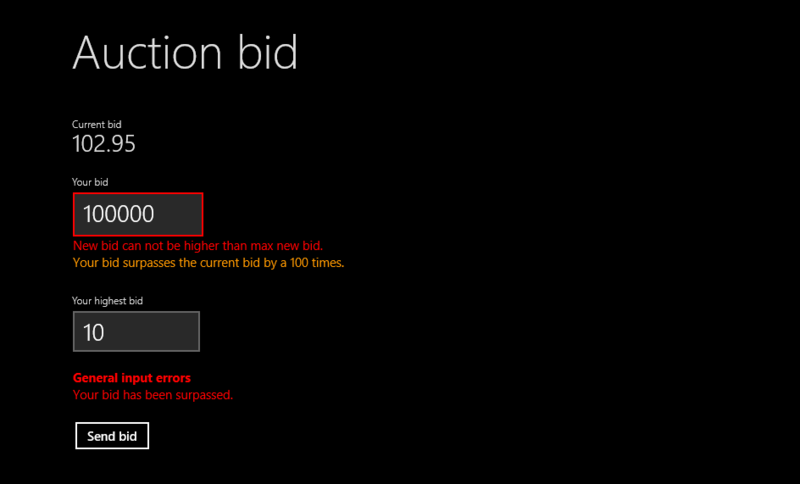 At least in „version 1“ (shipped with Windows 8 ) it has several shortcomings in various parts. One of those shortcomings is user input validation in C#/XAML Windows Store Apps. Of course there are Data Annotations in .NET 4.5 for WinRT and the ValidationAttribute, also the INotifyDataErrorInfo interface is available. But what’s missing is the whole UI stuff. 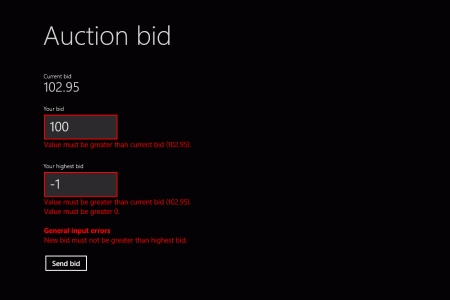 There are no UI controls or attributes on existing UI controls to show errors for validated properties. Hence at the moment you’re forced to execute validation manually and react accordingly to update the UI state. 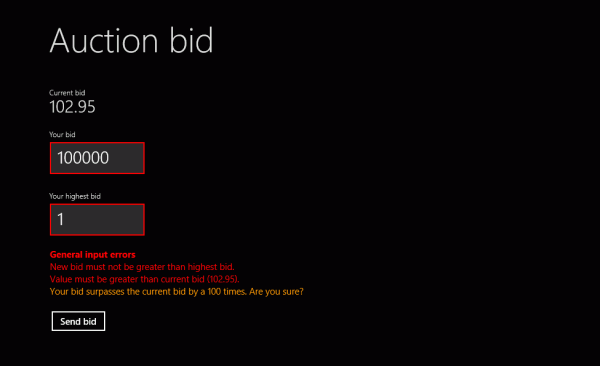 I’ve been unsatisfied with this lack of support for complete user input validation in WinRT/XAML. Thus a colleague and I developed a library, that fills the missing pieces and goes beyond trivial validation tasks. We needed comfortable and extended validation functionality for one of our development projects and now we want to make the resulting bits available as easy-to-use library. 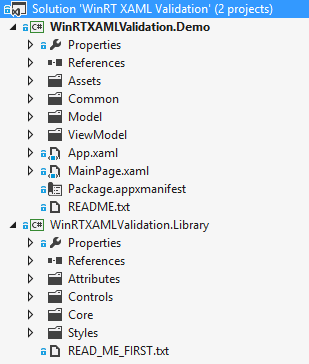 WinRT XAML Validation has a project page on Codeplex and is free-to-use under the Ms-PL license. The WinRT XAML Validation library is aimed to give developers a consistent, flexible and easy-to-use library to perform user input validation in WinRT/XAML apps. Developers should get a generic approach, that guides them through all steps of validating user input and performs the work for them. Validation Attributes: Define custom validation logic with Data Annotations on your model entities. The library contains extended base attributes for validation with support of warnings/errors, async validation and validation logic, that spans more than one property. Implicit Validation Execution: Use the ValidationBindableBase class on your model entities to perform validation. You can opt-in to let validation execute automatically when a entity property changes (implicit validation). Explicit Validation Execution: Instead of running validation everytime a property changes on your model entities, you can call the ValidationBindableBase.ValidateAsync() method explicitly to validate the defined validation attributes. Manual Validation: Besides the use of validation attributes to define validation logic, you can easily perform custom validation logic and add corresponding validation messages to a Dictionary, using the ValidationBindableBase.ValidationMessages.Add() method. The provided UI controls will update themselves automatically. Validation UI Controls: There are two easy-to-use XAML UI controls to show validation messages. First there is the ValidationPanel control that wraps a control whose bound property should be validated (for example a TextBox). If validation fires for the property, the ValidationPanel will show a red border (orange for warnings) and optionally the validation message. More than one validation message is supported. The second control is the ValidationSummary, which can show aggregated validation messages for a whole form and its bound entity. Both controls update immediately when validation messages change, even in async scenarios. I want to give credit to the Patterns and Practices group at Microsoft for developing and releasing the Prism for Windows Runtime library (f.k.a. Kona). It’s an awesome library that adds much value to the development of WinRT apps and I encourage you to check it out if you’re serious about Windows 8 business app development. Basic ideas and concepts for the WinRT XAML Validation library are borrowed from Prism for WinRT. For example, the BindableValidator class has been taken over, but includes much more functionality now. While Prism for WinRT comes with some validation bits, WinRT XAML Validation comes with a more complete approach to user input validation. Ok, after some intensive implementation weeks, I think I should blog some articles about tips’n’tricks when developing Windows 8 Metro apps with WinRT and C#. This first article is about the DataPackage class. You need to get in touch with this class when you want to exchange data from app to app by implementing the Share contract or when you want to implement custom drag&drop functionality in your own app. DataPackage has built-in functionality for exchanging a variety of document formats: Bitmap, Html, Rtf, Text, Uri and StorageItems (files and folders). Especially in the drag&drop scenario these standard data formats often aren’t enough. 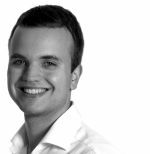 Imagine a grouped ListView or GridView. Because of the grouping you have to implement drag&drop manually in WinRT Metro apps. Now if you want to exchange data between the drag event and the drop event, you often want to fill the DataPackage with data objects of your custom data types. Unfortunately, that’s not possible out of the box with the DataPackage. Only scalar types, implementations of IRandomAccessStream or IStorageItem and IUri are supported. So, there’s no possibility to write the real instances of your objects into a data package in the drag event and read them in the drop event. But here’s the solution: serialization and writing into an IRandomAccessStream. While you serialize and deserialize your object, you won’t get the original instance in the drop event, but if it’s ok for you, then this method works fine. The string parameter „formatId“ specifies the identifier for your data format in the DataPackage. Note how the IRandomAccessStreamExtensions methods use the DataContractSerializer for serialization and deserialization. This means that your data class has to be decorated with the DataContract and DataMember attributes to specify which data should be serialized. I hope you can use this little helper in some cases when working with the DataPackage for sharing data. In some next blog post I want to show you how to manually implement drag&drop in your grouped ListView and GridView in WinRT Metro apps. Stay tuned! Currently I’m very busy in creating a bigger Windows 8 Metro app for managing private financial data. 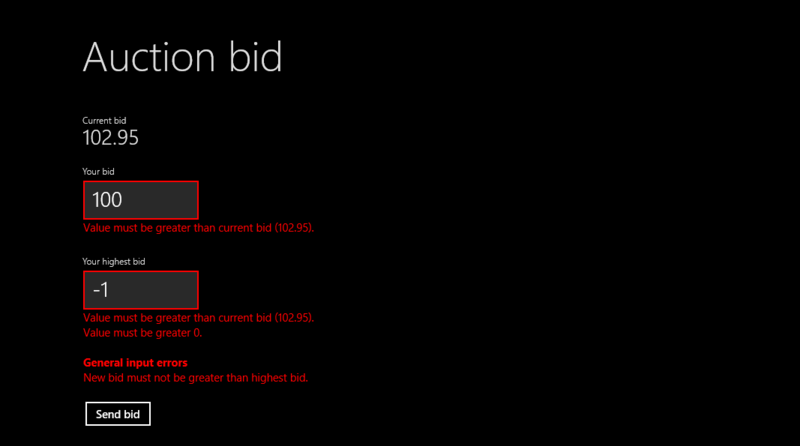 I’m creating the app with the WinRT/.NET 4.5/C#/XAML programming model of Windows 8 and my first experiences are good. Of course, in the Windows Consumer Preview and VS11 Beta there are some nasty bugs when creating apps, but altogether it’s quite nice.